o potio n. by the artist Thea Djordjadjze (born 1971, Tbilisi, Georgia). 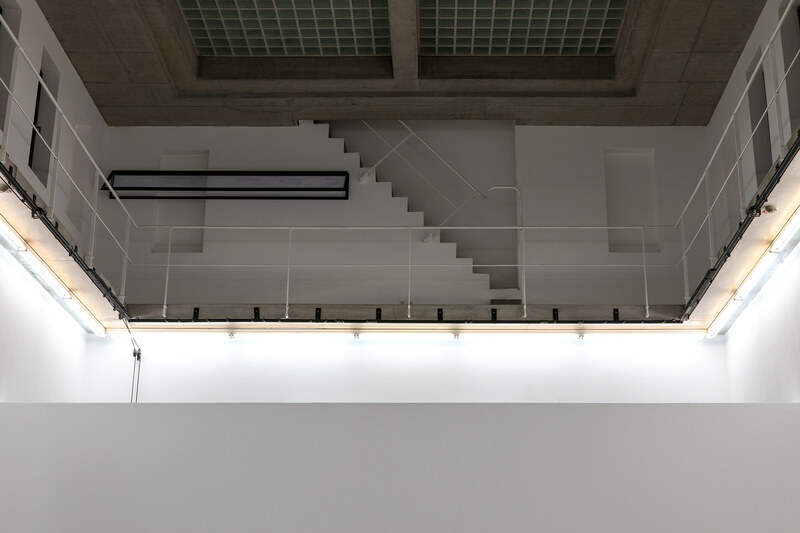 The exhibition hall at Portikus is the starting point of her works for o potio n. Height is the significant architectural feature at Portikus, which sprawls over several levels from the Maininsel to the Alte Brücke and beyond. 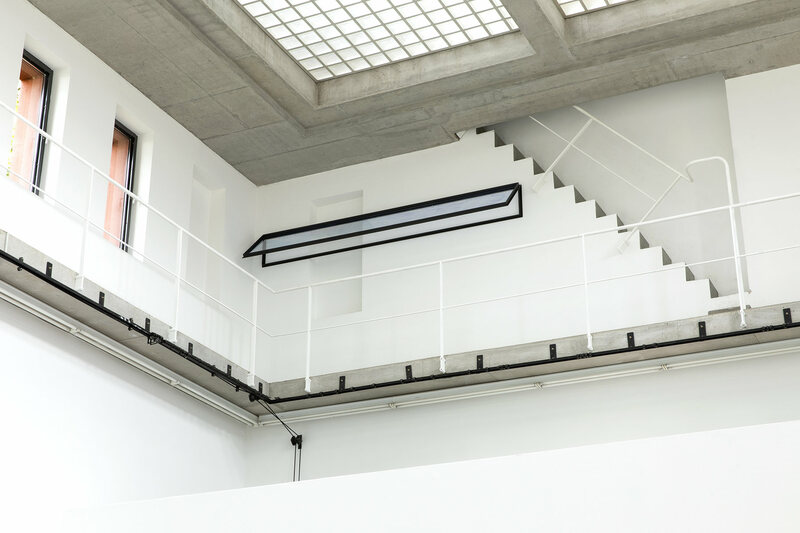 The interior of Portikus is a white cube without a visible past. 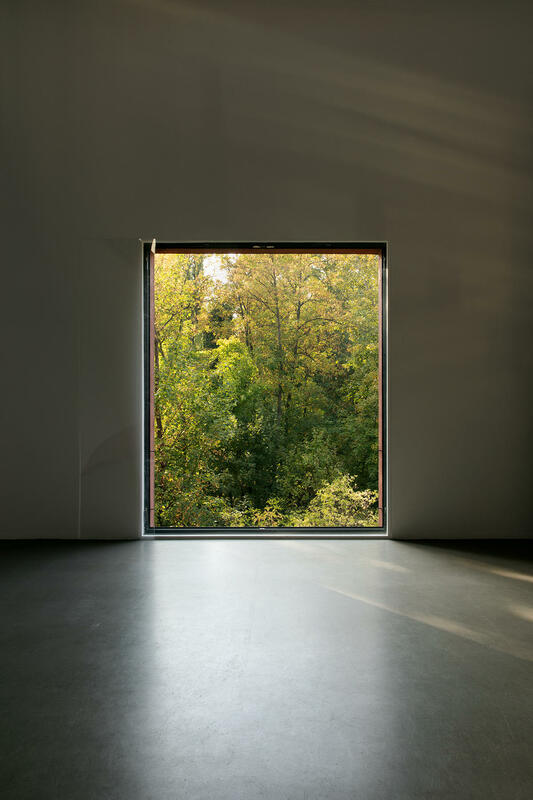 Upon entering the building on ground level over a bridge from the street, the symmetrically conceived architecture leads one’s gaze from the door through the exhibition space and out to the treetops of the Maininsel. 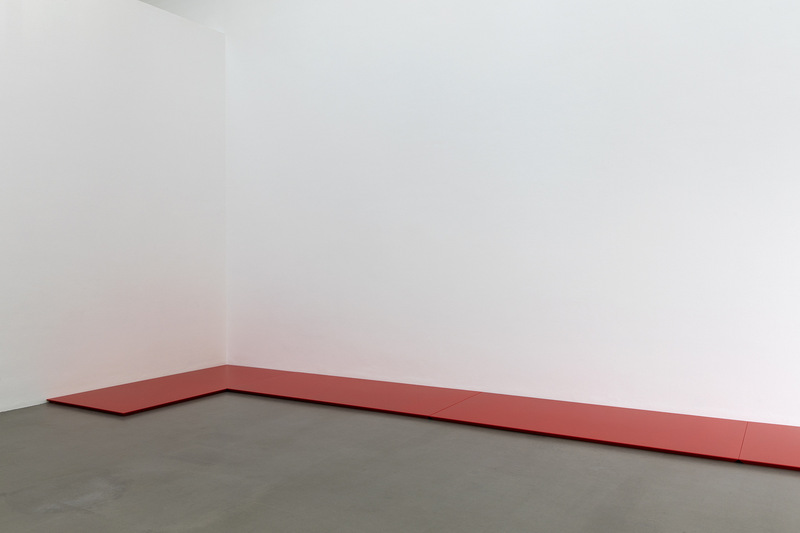 It is not so much the histories of sites that Thea Diordiadze refers to in her installations, but more their elements, axes, or the special idiosyncrasies that constitute a space. 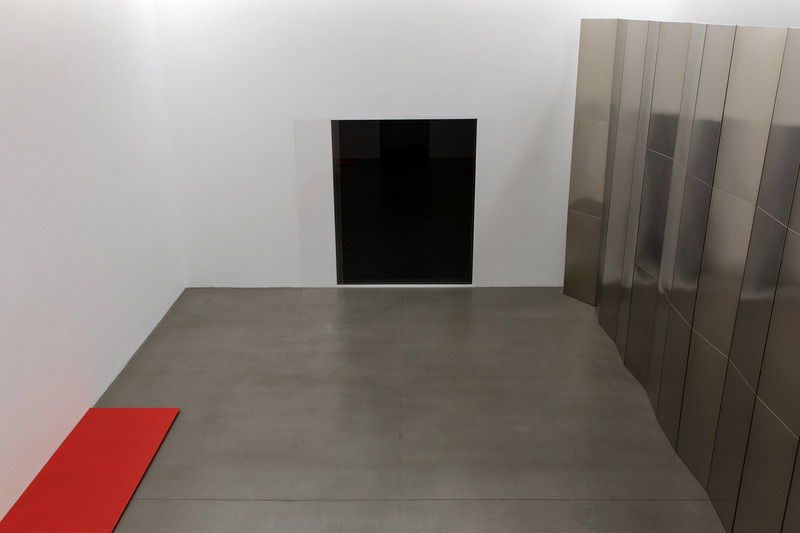 Consequently, the spaces in her exhibitions are not to be understood as mere presentation venues, but rather as studio exhibition spaces that are at the beginning and the end of her ideas about the exhibition. 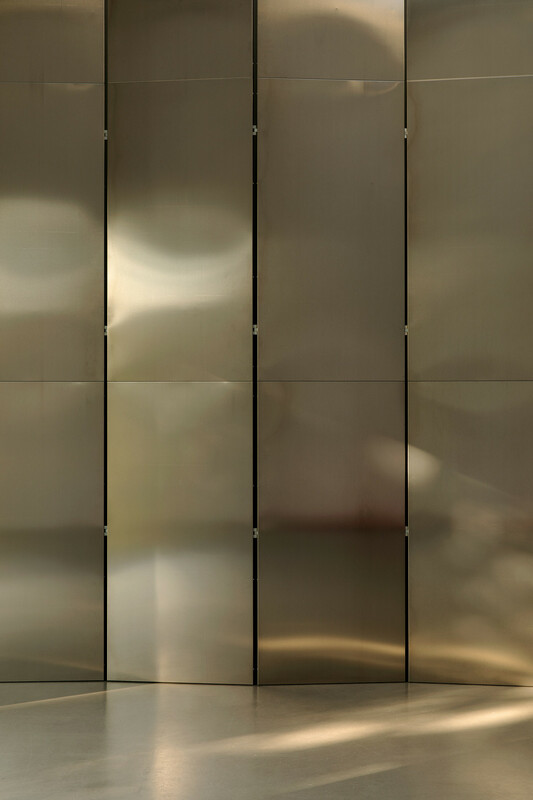 Djordjadze’s works are thus hardly “just” presented in space; instead, they inform a visitor about their own character and phenomena. The work Why hold on to that? 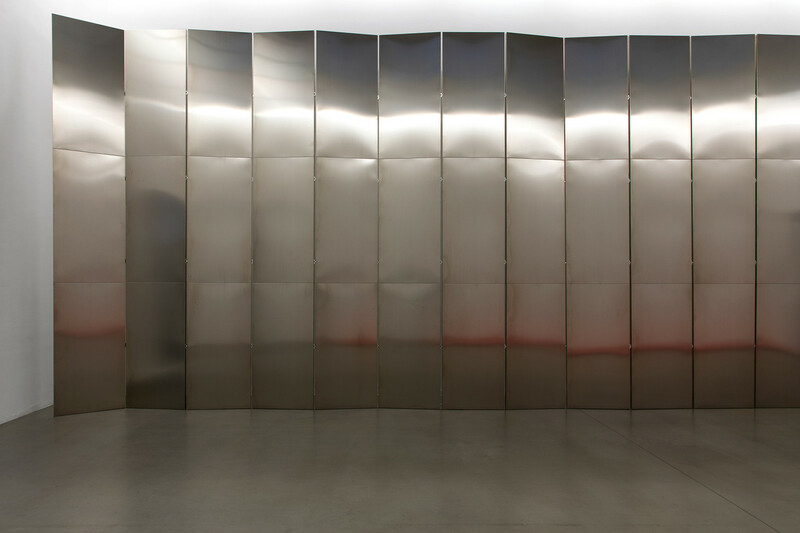 (2018), which was produced for the exhibition, is a high wall consisting of a restless yet self-contained structure of aluminum sheeting. 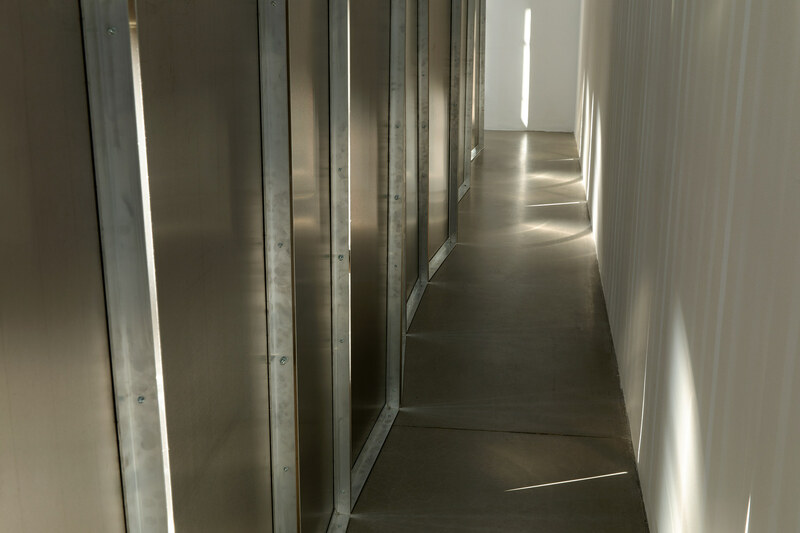 Walls create a space and exist on two fronts: they close off the exterior, but also enclose the interior. 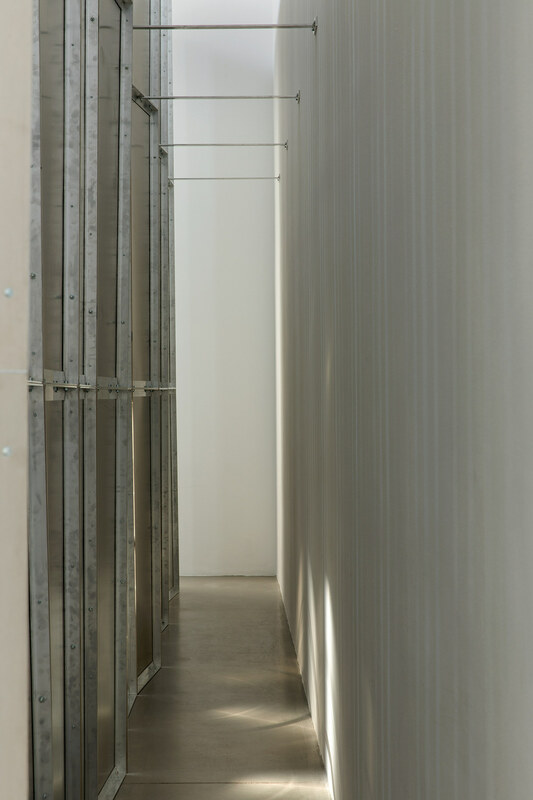 Standing at a distance from the architecture and stabilized with struts, there is a passageway between the building’s wall and the work which leaves the back of the work visible and, at the same time, concealing the exhibition space’s functional wall. 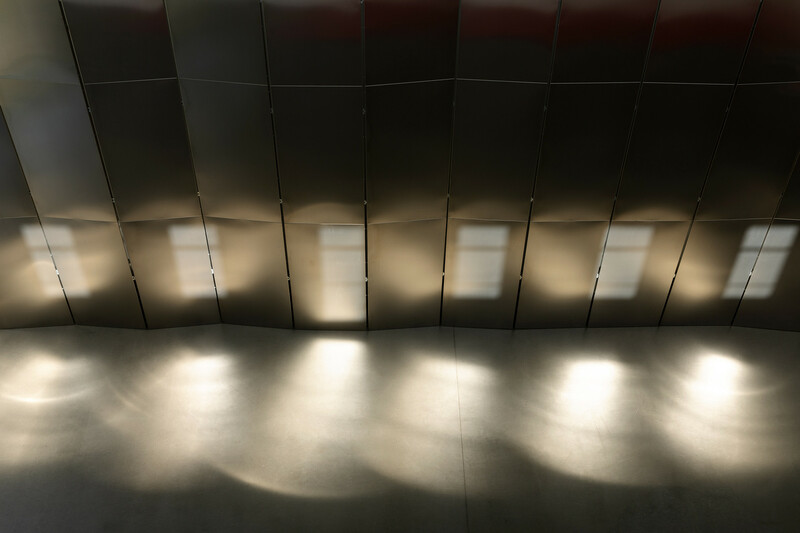 The function of this new wall is not decisive, but rather the qualities of its materials and construction, which insert themselves into the architectural elements of the exhibition and follow its system of architectural and phenomenal relationships. 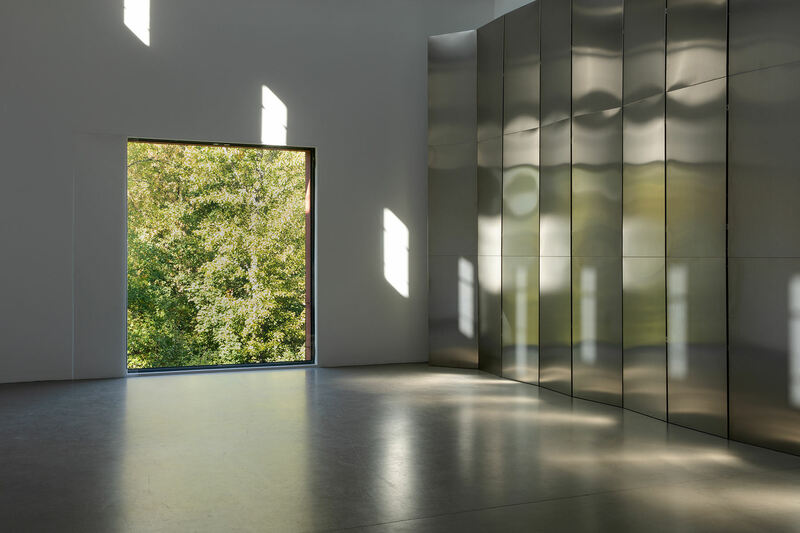 The light falling in from the exterior is reflected on the aluminum, creating an image of the Maininsel’s garden and its trees in the interior. 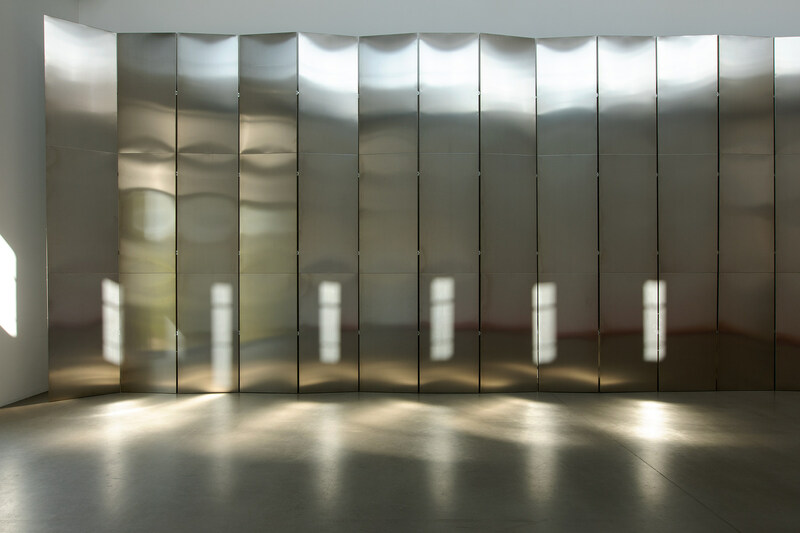 As one moves through the space, this reflection changes to one of the room and the works within it. 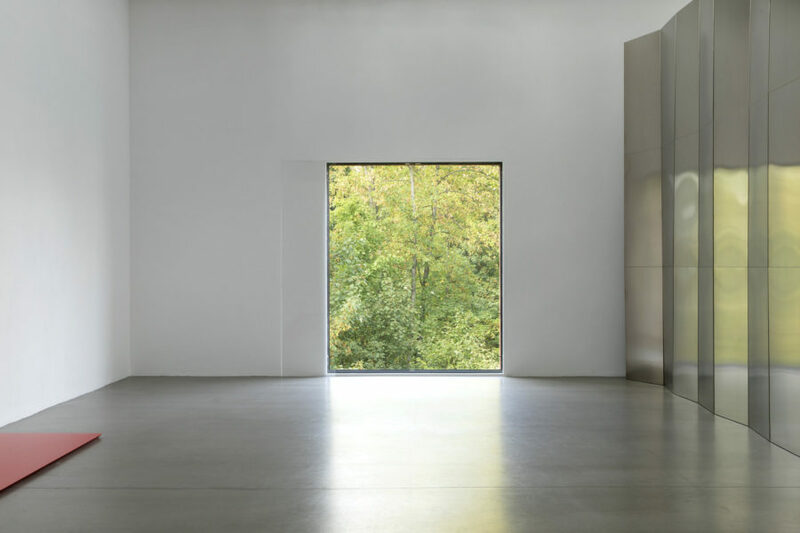 The window which usually consists of double doors and a railing has been replaced by a sheet of glass. What do you know about Moon. Water. Air. Sunrise? 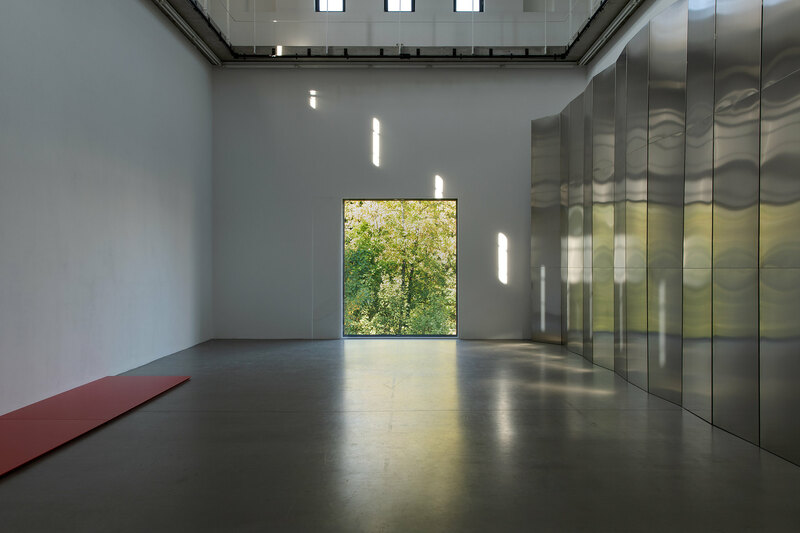 (2018) lets the trees, weather, and the respective times of day and year assemble into a single image in the exhibition space. 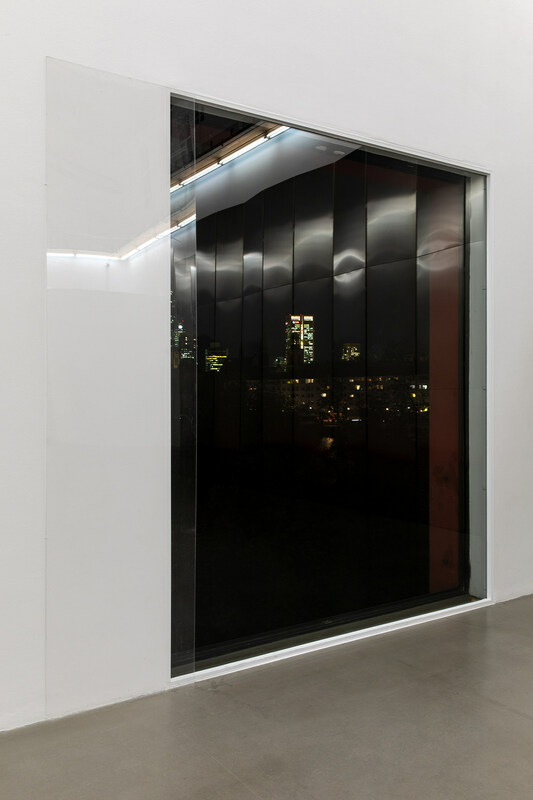 The surface of the new window glass is extended by a sheet of plexiglas which likewise guides the light from the exterior to the interior along its edge. 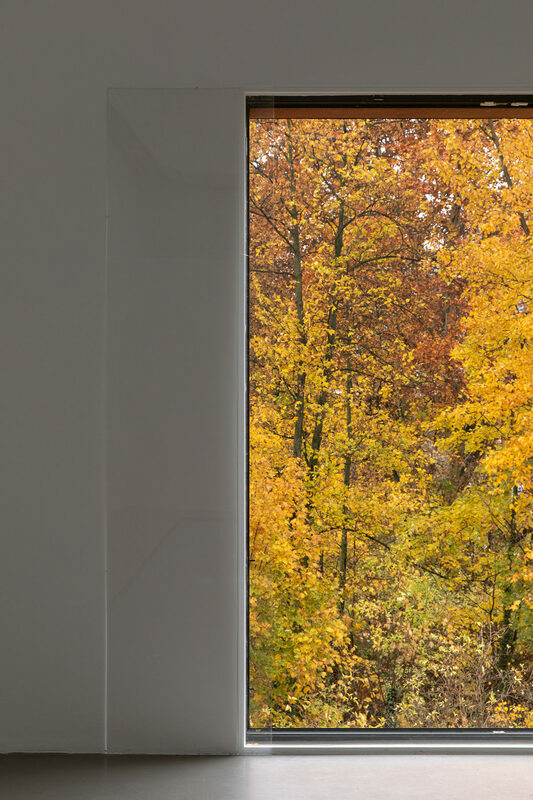 The architectural edge of the window frame is thus displaced to the interior wall. As a counterpart to the standing vertical format work What do you know about Moon. Water. Air. 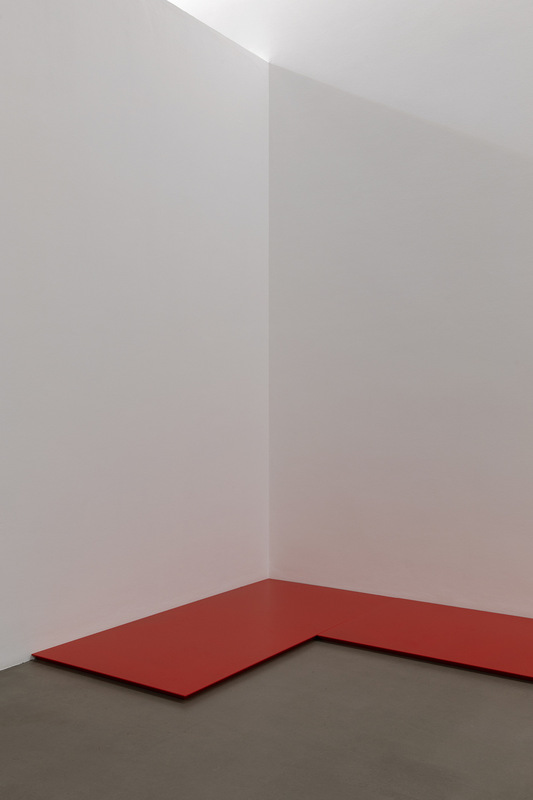 Sunrise?, a minimally elevated pedestal lies on the floor (o.T., 2018), contesting its presence in relation to the room’s height through its red coloration, which is in turn reflected by its counterpart. 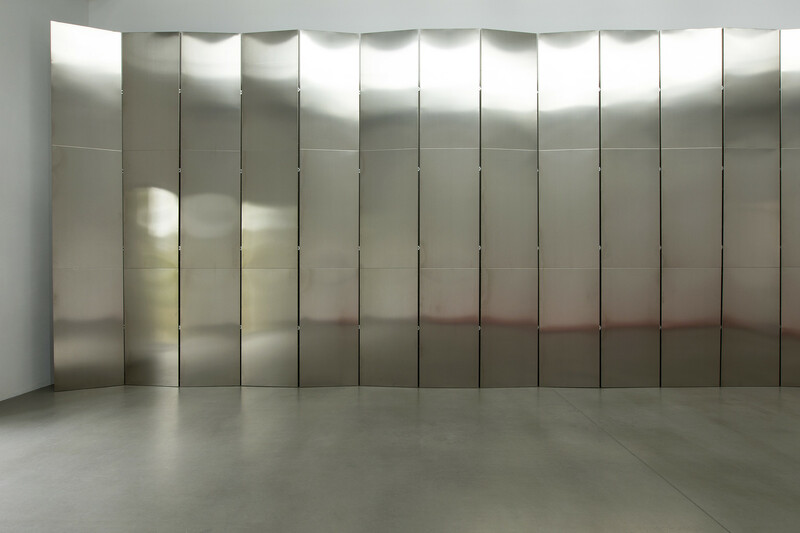 The sculptures in the installation work with the grammar of architecture: wall, ceiling, floor, and window. 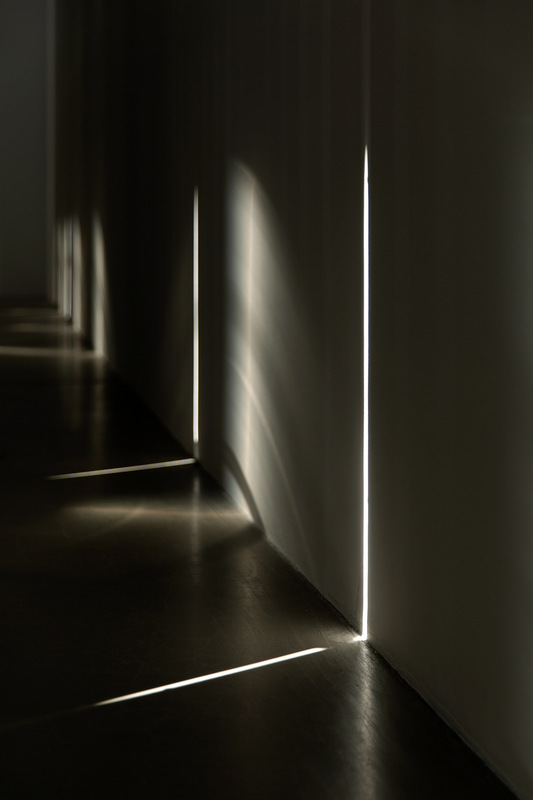 They thematize these functions and intensify their corresponding architectural qualities. 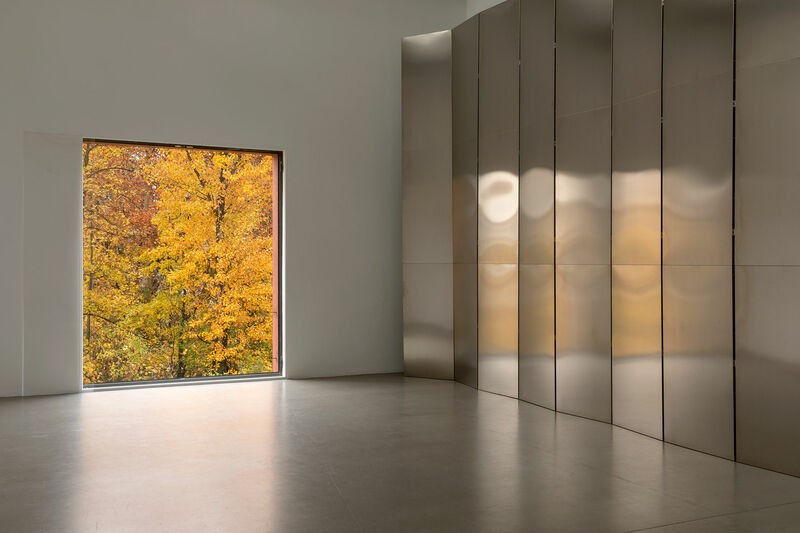 Walls and heights can easily become dominant gestures, but in the exhibition the wall is tamed into a canvas for the image of the living nature outside and the space inside. 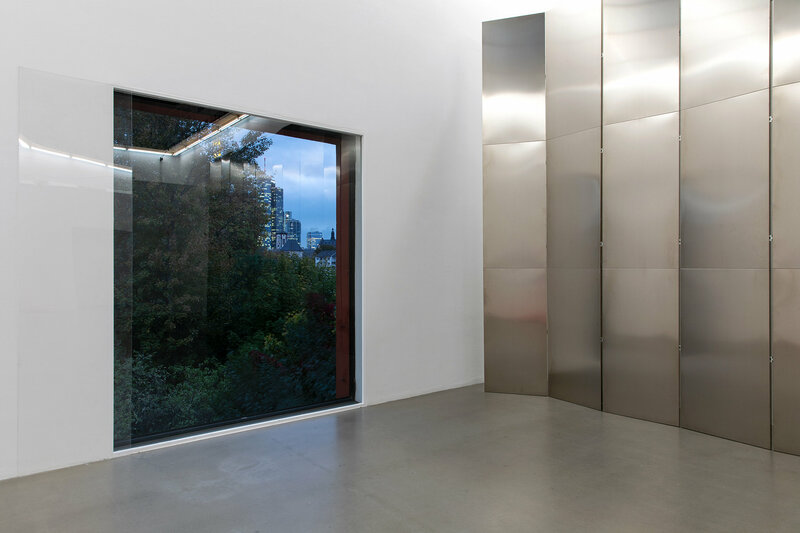 The architecturally constructed view of the nature outside is thus reproduced in a distorted form, whereby curvatures and reflections become their own visual qualities. 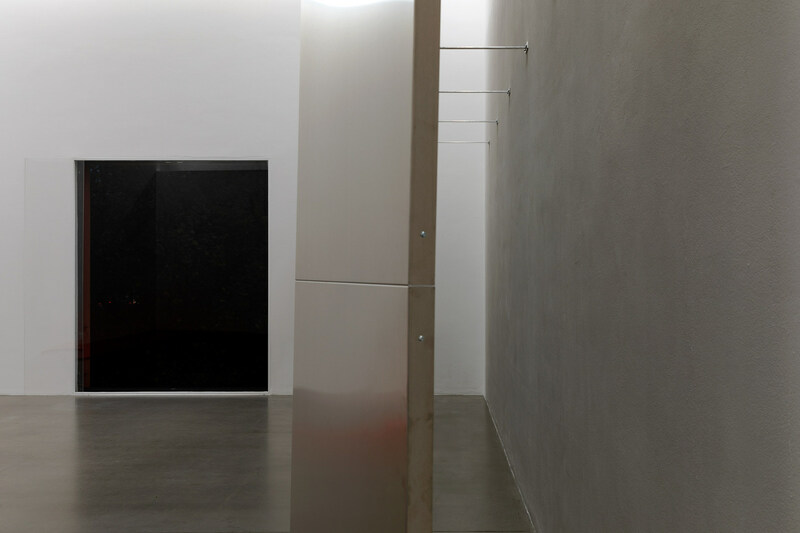 o potion n., the exhibition’s title, could be read as an abbreviation of the word “opposition,” an unfamiliar abbreviation or simply concrete poetry. Opposition means to set something against something else, or even to adopt another perspective. 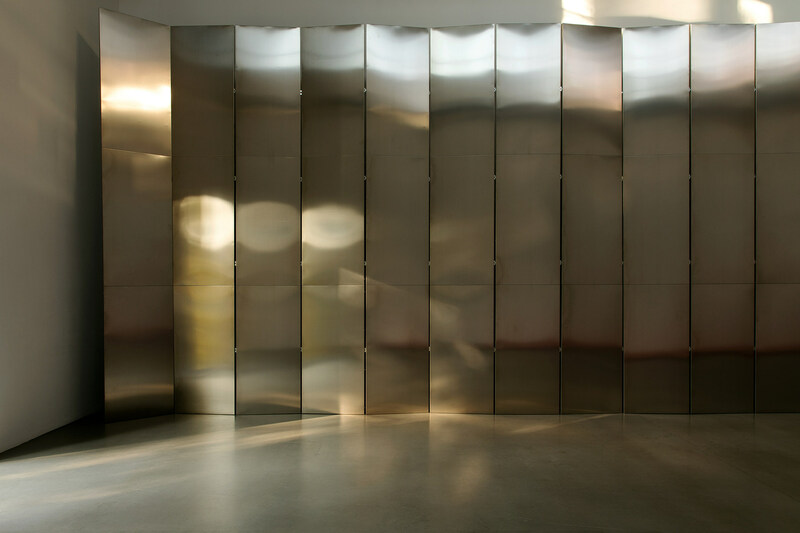 These works, however, are not so much a setting against, but rather create an alternative way of approaching the given ephemeral phenomena of space. 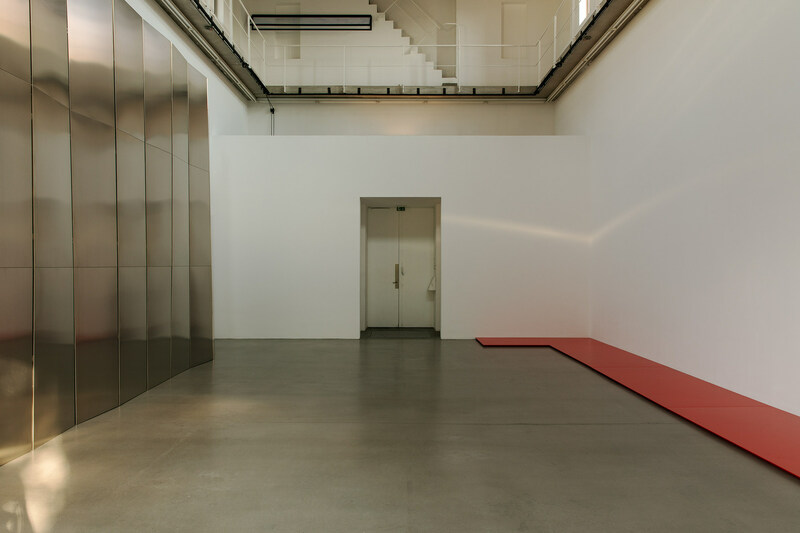 The connection between the space and the installations, which often act as independent systems within the space, remains opaque, yet there is a noticeable, active exchange that is maintained in the limbo between functional architecture and a selfsufficient system. 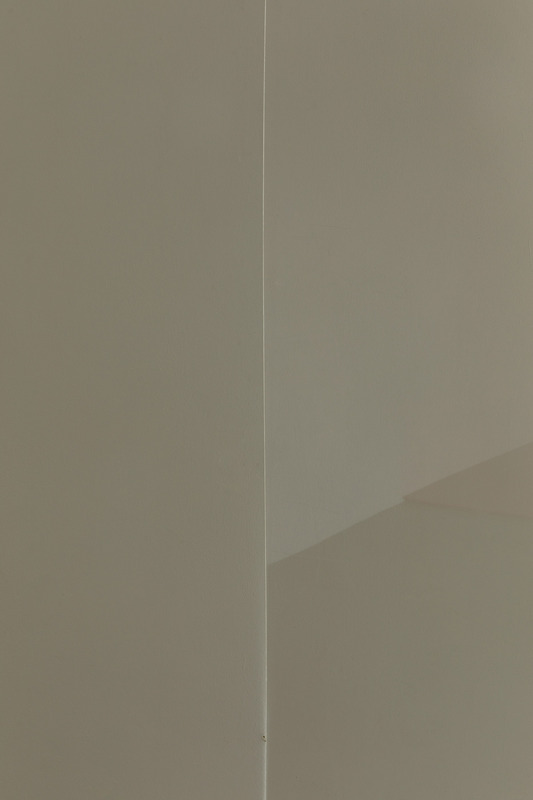 o potio n. is an exhibition about art and space in the same mode. Portikus is both institutional and architectural: both a place and a building. 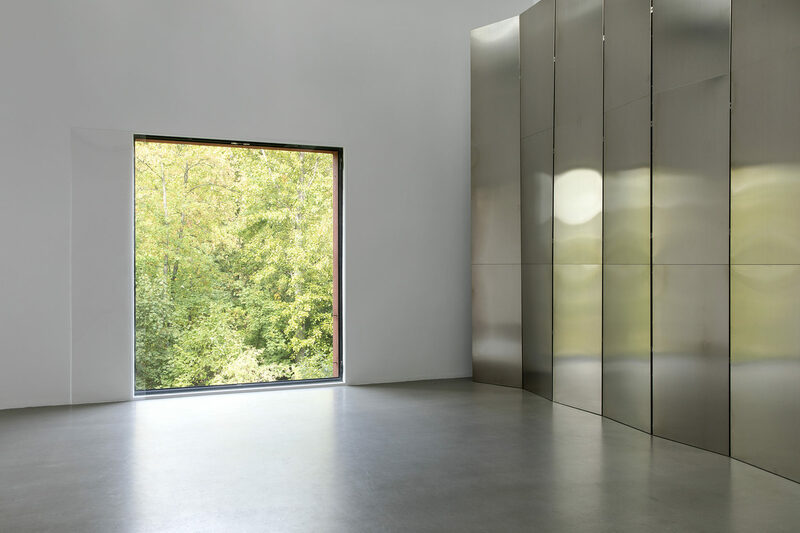 The moment in which both – art and architecture – are coming together, is that of the exhibition, since window and picture, floor and pedestal, wall and image exist at the same time. Thea Djordjadze (born 1971, Tbilisi, Georgia) lives and works in Berlin. Her work has been shown in numerous solo exhibitions, such as Pinakothek der Moderne, Staatliche Graphische Sammlung München (2017); MoMA PS1, New York (2016); Secession, Vienna (2016); South London Gallery (2015); MIT Cambridge (2014); the Aspen Art Museum (2013); Malmö Konsthall (2012); The Common Guild Glasgow (2011); Kunsthalle Basel (2009) and Kunstverein Nürnberg (2008). 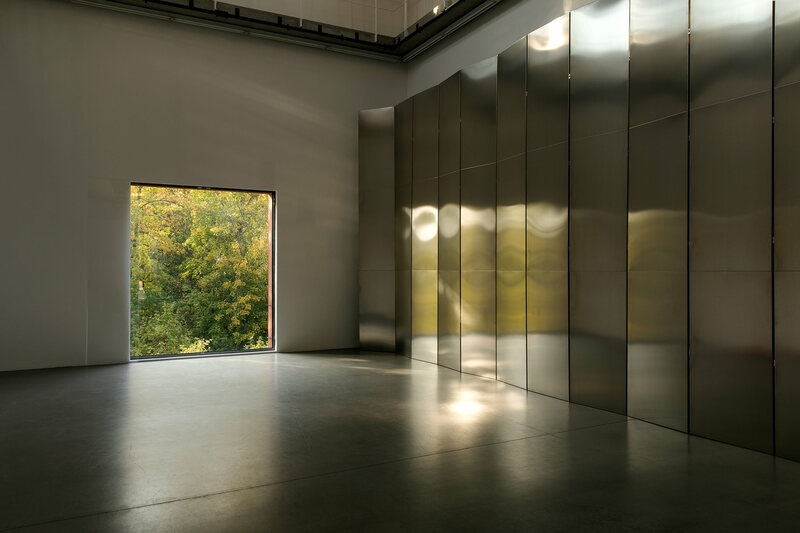 Major group exhibitions include the 56th Venice Biennale (2015); dOCUMENTA 13, Kassel (2012) and BB5 – 5th Berlin Biennale (2008). In collaboration with the Creative Georgia and Georgian National Book Center, on occasion of Georgia’s appearance as the Guest of Honour at the Frankfurter Buchmesse 2018, with the generous support of the Ministry of Education, Science, Culture and Sport of Georgia. Exhibition title: o potio n.
© Thea Djordjadjze, Portikus, Frankfurt, Germany E.U.